Do you like using work and productivity apps on your mobile device? Yeah, me neither, but Microsoft wants to change our minds with its new—free—apps for iPhone and for Android tablets. 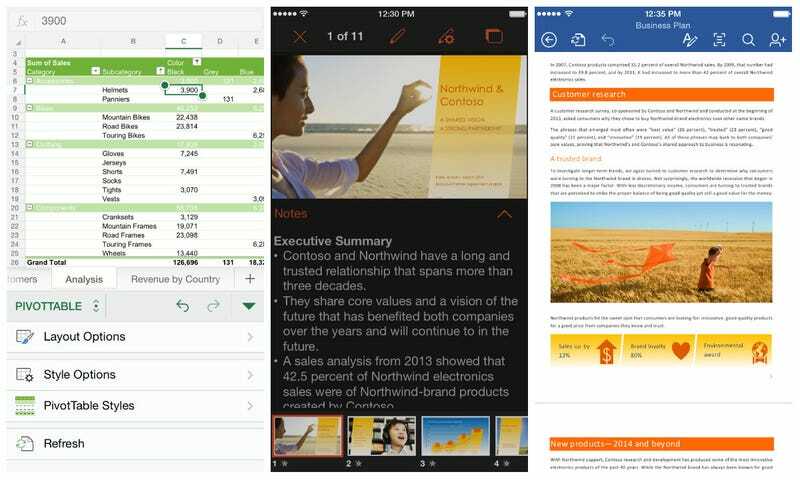 Until now, if you wanted to use Office apps on your iPhone you were ushered into the sad existence known as "Microsoft Office Mobile," which was a hub for Word, Excel, and PowerPoint. Once in the app you could read docs and do some text input, and that was about it. Starting today, Microsoft will be unbundling its well-known trio of productivity services into three separate apps. The widely successful Office for iPad app is a near exact copy of what you can now expect for iPhone, only optimized for the portrait platform. Starting today, you'll be able to do a lot more than just edit text. You can basically navigate every application completely, tweaking fonts, creating slideshows, formatting spreadsheets and all the editing tools that come with it—all for free. Microsoft will be squirreling away a few pro features like pivot tables and other presentation formats, but for the average user, you won't even notice. The idea of actually doing any editing on a smartphone sounds like a terrible idea, but Microsoft includes a cool little feature called "reflow view" that makes iPhone productivity less nightmarish. Now, when you open a Word document and switch into reflow view, the original document stays the same but is now blown-up and scroll-friendly, letting you edit and select text way more easily. In addition to this new iOS software, Microsoft is also announcing a preview for Office for Android, bringing the much lauded iPad app to the Android tablet family. The Office team also says that it's working on "touch-optimized" apps for the upcoming Windows 10 platform. The team promises more details will be released later, but they plan to time the apps' release with the eventual launch of Windows 10 next year. It's going to take more than a few new apps to pry a keyboard and mouse from my blog-writing fingers, but after taking a tour of the new mobile Office—let's just say my grip is loosening.